Demands always sound much more unreasonable when you add a pony to them. What do you demand? Say it loud and clear, and make sure it’s unreasonable! Add it to my post comments and I will try to draw a pretty picture of it for this blog. Any demands that are not unreasonable enough may either have a pony or a cookie added to them for emphasis. I can’t hear you… put some more WHINE into it, you wuss! This entry was posted in Art, drawing, Humor and tagged art, demands, Drawing, ink, postaday2011, Type, Typograpy, Unreasonable demands. Bookmark the permalink. 6 Responses to Unreasonable demand #2, and a pony. I could so get you a pony. Piece of cake. Oh, I want that one, too! No, wait… I don’t want the job. 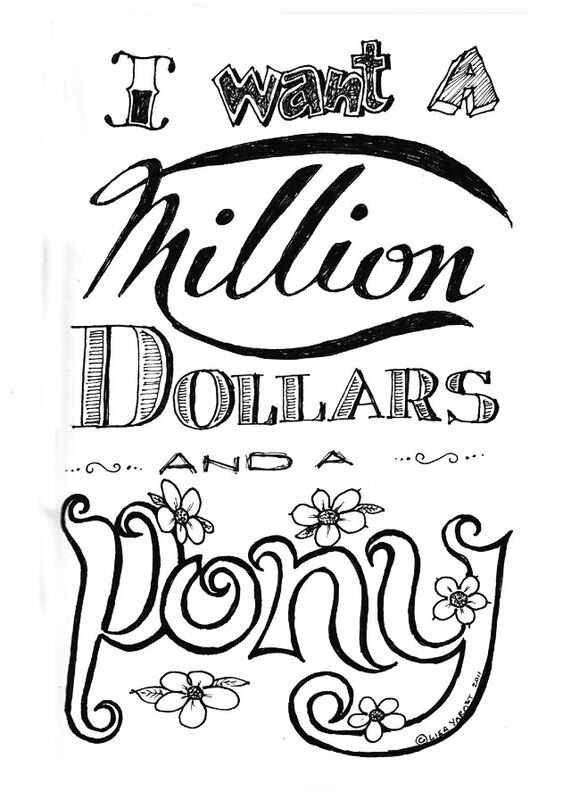 Just the million dollars and a maid riding a pony. Did you make her on Bernina? I have a similar model. I want to be her too, Laura. As Morty Constanza would say, “SERENITY NOOWWWWWWW!!! !